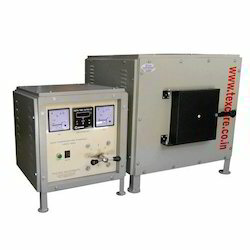 We are Muffle Furnace Manufacturer in Delhi. 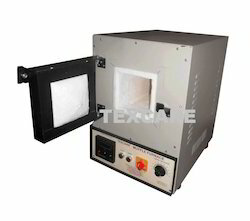 Our Muffle Furnace is used to determine ash content of material like Polymer, Polyethylene, Polyester, Nylon, Cork, or any other material. The Muffle Furnace has robust Construction with muffle of high-grade refractory wound Kanthal Heating Elements, Sealed with embedding cement. Temperature is controlled by Digital Temperature Indicator and Controller fitted in the base front panel of the Muffle Furnace.Front Panel of Muffle Furnace has two indicator lights.Designed to operate on 220 Volts, single phase 50 Hz A.C. The casing is made of thick mild steel sheet reinforced with angle iron. Maximum Temperature of Muffle Furnace 1000 to 1450 Deg. C Excess temp cut off fuse is provided in the Furnace. We are one of the leading Muffle Furnace Manufacturer. The High Temperature Muffle Furnace is highly appreciated by our clients for its working. It has robust Construction with muffle of high grade refractory wound Kanthal Heating Elements, Sealed with embedding cement. We are manufacturer of Digital Muffle Furnace in large scale. These Digital Muffle Furnaces are having microprocessor-based temperature controlling and digital temperature indicator with accuracy of 1 degree Celsius. Digital Muffle Furnace help to maintain a particular temperature for long time with up and down of 1% of set temperature.